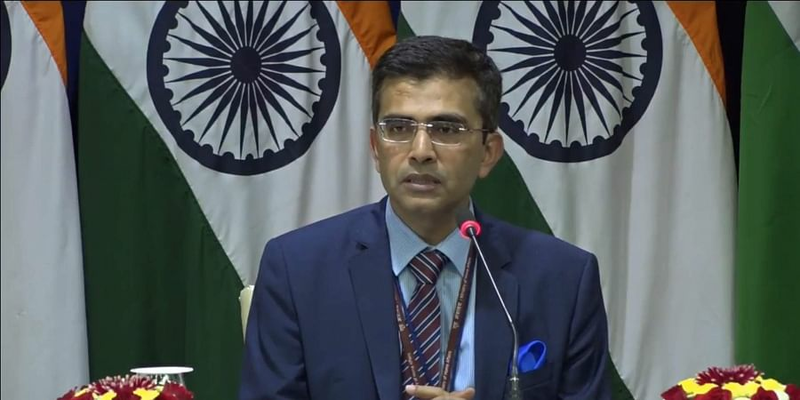 External Affairs Ministry spokesperson Raveesh Kumar also said that India has made it "very clear" to the US that the whole process should be Afghan-owned, Afghan-led and Afghan-controlled. NEW DELHI: A day after Army Chief Gen. Bipin Rawat stated India cannot be left out of the "bandwagon" when a number of countries are reaching out to the Taliban, the External Affairs Ministry Friday said there is no change in the position on Afghanistan and New Delhi supports the process which is "inclusive" towards achieving peace. External Affairs Ministry spokesperson Raveesh Kumar also said that India has made it "very clear" to the US that the peace and reconciliation in Afghanistan should be Afghan-owned, Afghan-led and Afghan-controlled. He said this was conveyed during the meetings US President Donald Trump's special Afghan envoy Zalmay Khalilzad had with External Affairs Minister Sushma Swaraj and Foreign Secretary Vijay Gokhale. Responding to a volley of questions on Afghanistan ranging from Khalilzad's visit to the Army chief's comments, Kumar said: "Essentially, both sides, we share perspectives on peace and reconciliation in Afghanistan. Mr Khalilzad briefed EAM and FS on their aspect as to how the US is trying to achieve peace and reconciliation in the country." On the question whether Pakistan's role in Afghanistan was discussed during the meetings, the MEA spokesperson said this is something which India has articulated time and again -- the destabilising role that Pakistan plays. The situation in Afghanistan was discussed, the Indian side did reiterate its policy on Afghanistan, Kumar said. "This is connected to the comments made by the Army chief. Our position on Afghanistan has been very clear and very consistent. We have said in the past and we continue to do so that India supports the peace and reconciliation efforts in Afghanistan," he said. "We support the process which is inclusive towards achieving this goal and there has been no change in that position," he said. His remarks come just a day after Army chief Gen Rawat, during his annual press conference, said: "A number of countries are talking to the Taliban. The issue we should address is -- do we have an interest in Afghanistan. If the answer is yes, then you cannot be out of the bandwagon." A day earlier, he had also that there should be talks with the Taliban but without "any preconditions". Trump's special Afghan envoy Khalilzad is leading an inter-agency delegation to India, China, Afghanistan, and Pakistan from January 8 to January 21.